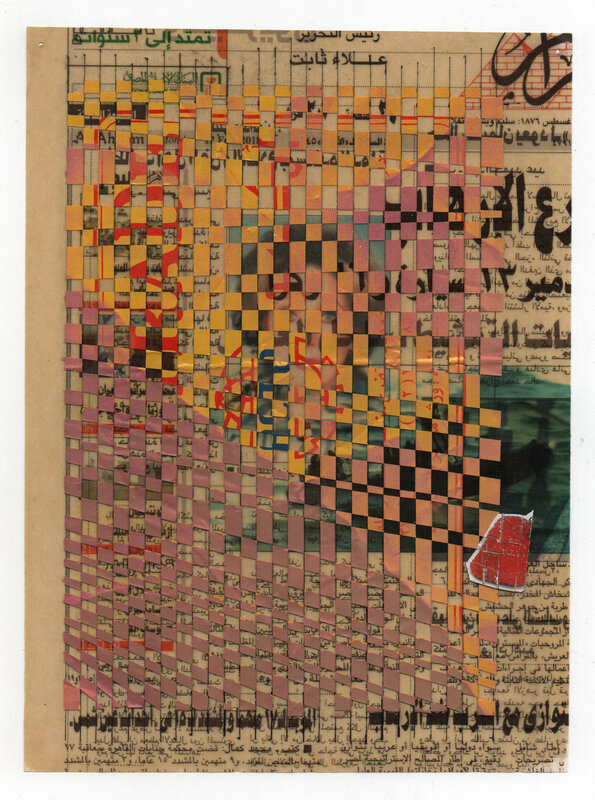 Mr. Bahgat Always Leaves A Newspaper On His Desk, 2018, poster, newspaper, each 22 x 32 cm (all together ~88 x 96 cm). 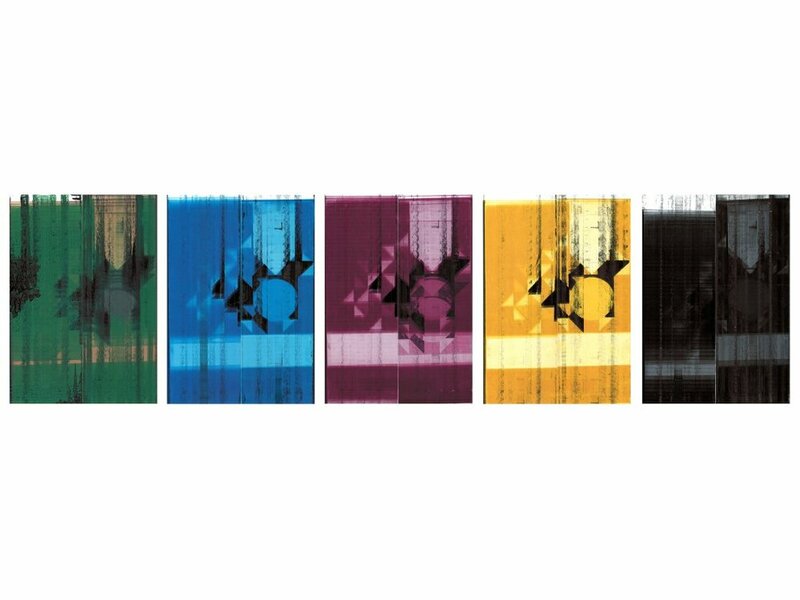 TQSX Model A Series Suction Type, 2018, magazine page, inkjet print, self-adhesive film, catalog pages, 26.5 x 20.3 cm. 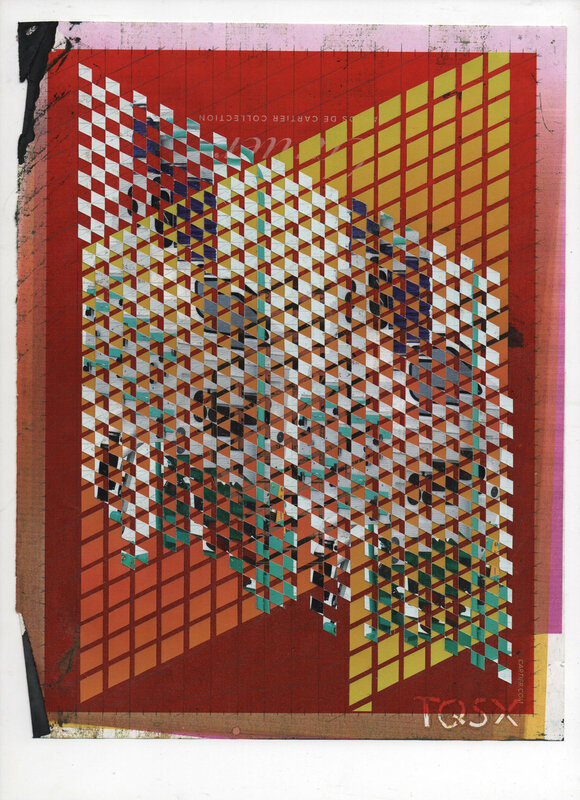 Office Boy Rolex, 2018, magazine pages, self-adhesive film, spray paint, 32.8 x 27.5 cm. 24 Hours Work, El Joker, 2018, magazine page, company sticker, self-adhesive film, spray paint, 32.8 x 27.5 cm. 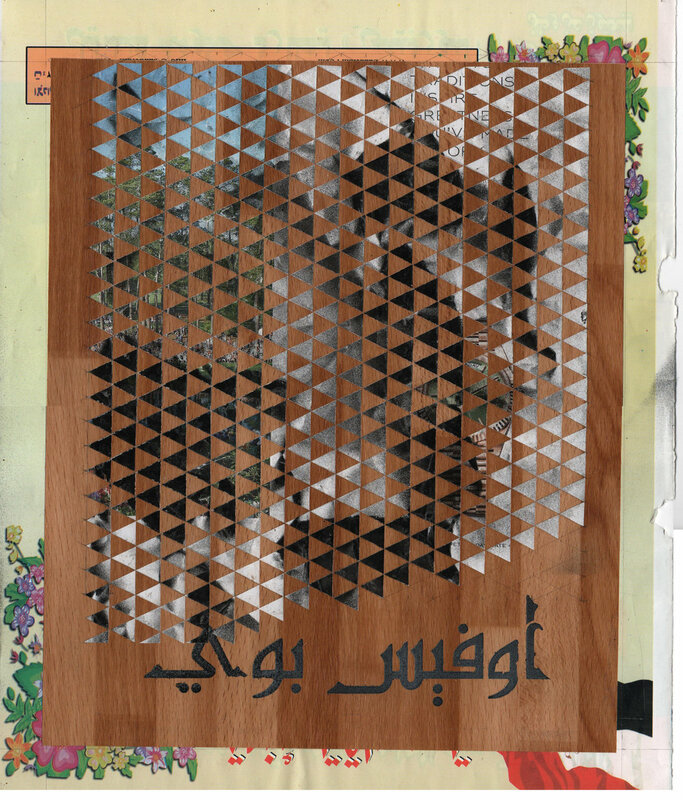 Promotional Materials On Alahram, 2018, newspaper, polyurethane, acto trade sticker, spray paint, 17 x 23 cm. 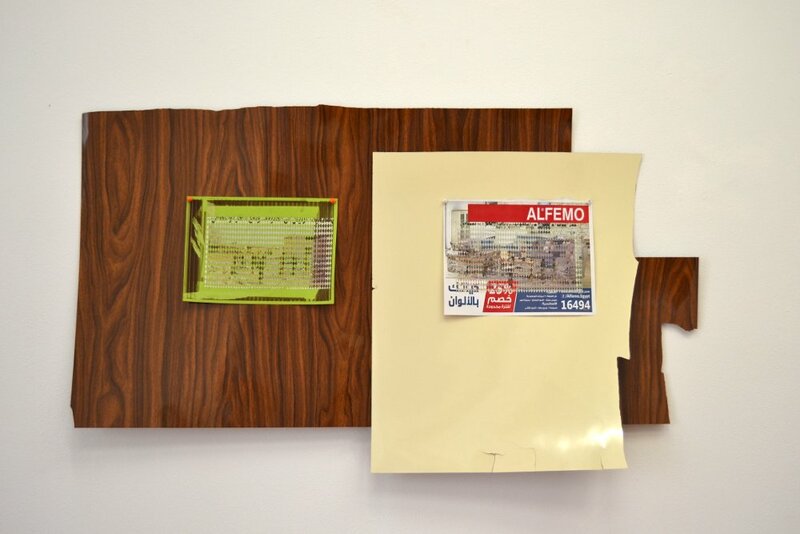 Promotional Materials On AlMasry Alyom, 2018, newspaper, polyurethane, acto trade sticker, spray paint, 24 x 18.5 cm. Machines Watches Fruits (SXWT168), 2018, brochure - packaging - inkjet on magazine page, 28 x 20 cm. 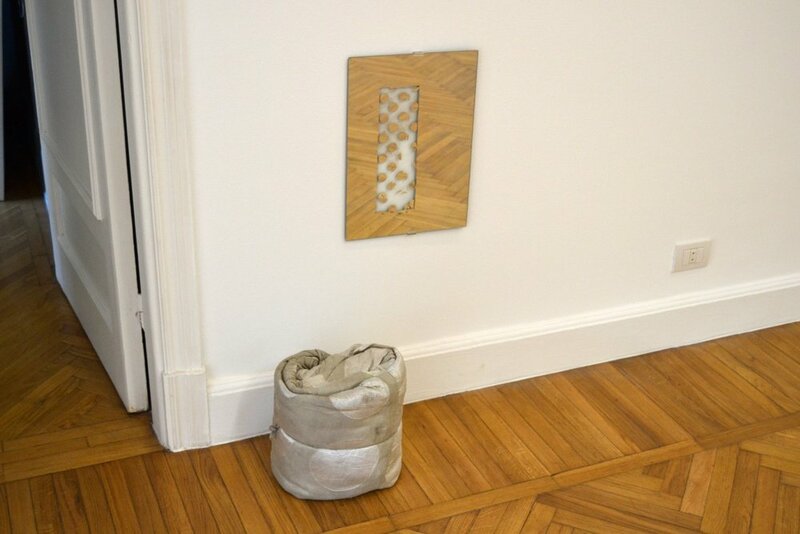 Gravity Stoners (TQSC), 2018, Aluminium - glass - vinyl - catalog, 34.4 x 24.2 x 4 cm. Dust Collectors (TBLM), 2018, Catalog - packaging - inkjet on magazine page, 27.5 x 20.5 cm. 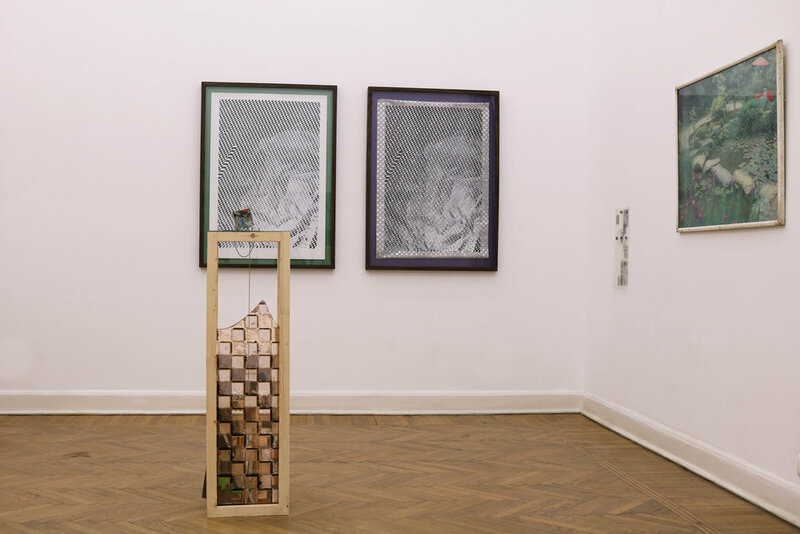 Rule for Life (Timepieces of Distinction), 2018, Newspaper cutout, 57.5 x 35 cm. Historic Regret (Timepieces of Distinction), 2018, Newspaper cutout, 57.5 x 35 cm. 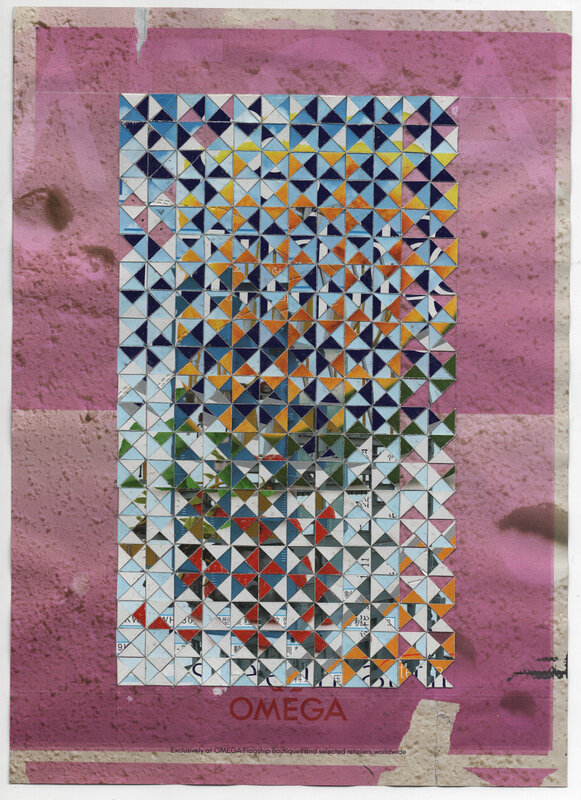 Diamond Bezel (Omega Seamaster, part 1), 2018, Magazine - vinyl on paper, 29.7 x 42 cm. 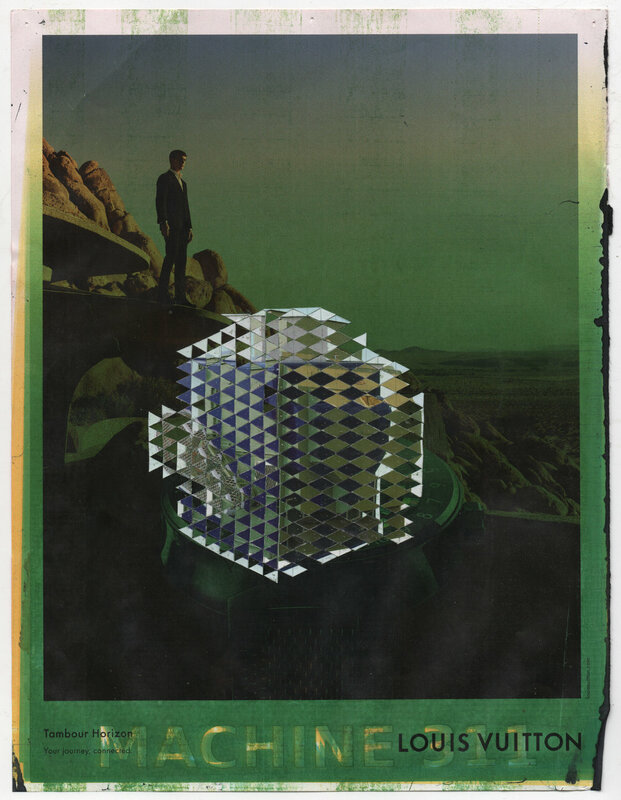 Diamond Bezel (Omega Seamaster, part 2), 2018, Magazine - vinyl on paper, 29.7 x 42 cm. Peach Machine 311 (TQSC), 2018, catalog - inkjet on magazine page, 26.7 x 20.5 cm. Gravity Stoners (TQSF), 2018, Vinyl - catalog - inkjet on magazine page, 26.7 x 20.5 cm. Untitled, 2016, Spray paint paper on book cover and page. Each 16 cm x 12 cm. Untitled, 2016, Inkjet on book page, 16 cm x 12 cm. Untitled, 2016, Framed inkjet on book page with flat blue laminate backing, 16 cm x 12 cm. Untitled (part 2), 2016, 60 cm x 90 cm, Spray painted vinyl on coated paper. Paperweight #7, detail, 2016, variable materials, variable dimensions, concrete cube 6 x 6 x 6 cm, wood pedestal structure, 20 cm x 30 cm x 105 cm. Untitled (red, green), 2016, spray paint on paper collage, on plastic transparencies from my father's office, 20 x 50 cm. Paperweight #2, detail, 2016, variable materials, variable dimensions, concrete cube 6 x 6 x 6 cm, pedestal structure, 20 x 30 x 105 cm. Paperweight #8, detail, 2016, variable materials, variable dimensions, concrete cube, 6 x 6 x 6 cm, pedestal structure, 20 x 30 x 105 cm. Paperweight #4, detail, 2016, variable materials including framed tractor parts book, variable dimensions, concrete cube, 6 x 6 x 6 cm, pedestal structure, 20 x 30 x 105 cm. Paperweight #5, detail, 2016, mixed media, variable dimensions, concrete cube, 6 x 6 x 6 cm, pedestal structure, 20 x 30 x 105 cm. 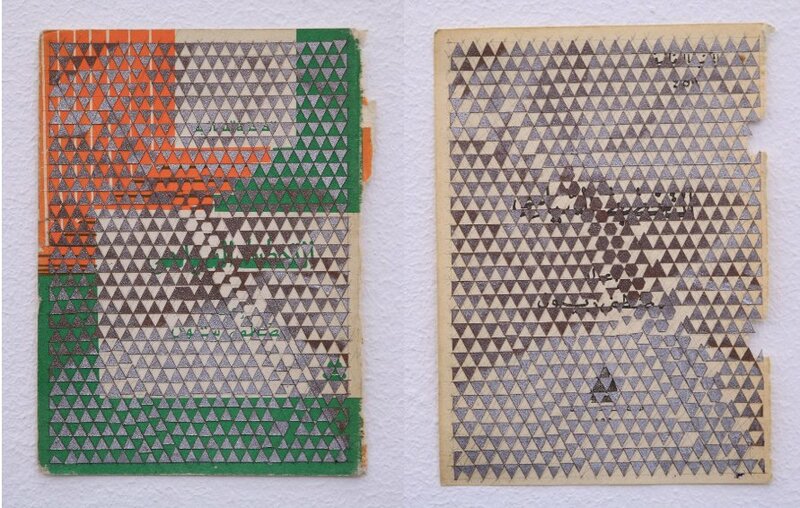 Untitled (Al Sharq Al Awsat), part 1 and 2, 2015/16, materials: Plastic laminate, newspaper on paper, newspaper on magazine advertisement, pins (installation view), variable dimensions.